As avid gardeners, Mr & Mrs Stacey chose a Solardome® glasshouse as the perfect structure for growing a host of different plants and flowers as well as providing protection for delicate citrus trees in the winter. It also became a local talking point when the couple entered ‘Godalming in Bloom’ competitions over many years. When Mrs Stacey moved to a smaller property, her 24-year-old Solardome® glasshouse was too large for her new garden, so she replaced it with a newer, more compact 4.52m SOLARDOME® Haven geodesic dome. 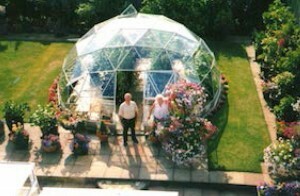 However, her previous Solardome® glasshouse was still in such good condition that it was sold to a Scottish resident establishment and is now used as a Yoga retreat. “After 24 years with our previous dome, I’m very happy with my new SOLARDOME® Haven. Not only does it provide me with somewhere sunny and warm to sit, but creates the ultimate growing environment and protection for my plants” said Mrs Stacey. 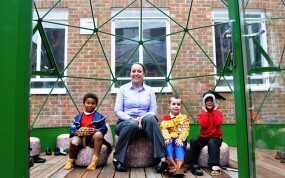 The school has transformed what was once a problematic, wasted area into a striking outdoor classroom – providing much-needed learning space with added ‘wow’ factor.